Sunday, November 24 1907 -- It's time for winter baseball in California, when (as Herriman so ably illustrates) many of the biggest stars from the Major Leagues back south head to sunny California to play the winter away for extra cash. In the inset vignette in the lower left we have pitcher Harry McIntire who, despite a fabulous arm, had a dismal winning percentage with the hapless Brooklyn Superbas. He'd get a chance to really shine when he went to the Cubs in 1910. Unfortunately I can't figure out Herriman's script on the other gent. By the way, this is a minor milestone for the blog -- post number 1500 today. Doesn't the Stripper ever shut up? I don't feel qualified to comment on 103 year old American sports satire, but I do love looking at Herriman's lines and compositions. Hello, Allan----The other fellow in this cartoon is "Scrappy" Danny Shay (1876-1927)(Spelled "Shea" by Herriman), a shortstop, later manager, prone to little loyalty. He jumped from one team to another, from the established eastern teams to the minor-league California clubs. He was active from c. 1900 to 1917. In 1917, he was managing the upstart Federal league's Kansas City team. After a game in Indianapolis, he was dining at a restaraunt and deep in his cups, when he shot a black waiter for percieved rudeness. He beat the rap in an apparently obvious miscarriage of justice. He was a employed as a baseball scout after this. In bad health, he committed suicide on Dec. 1, 1927 in Kansas City. -----Cole Johnson. H.C. Greening had a vivid and original imagination that always make his features a special treat. 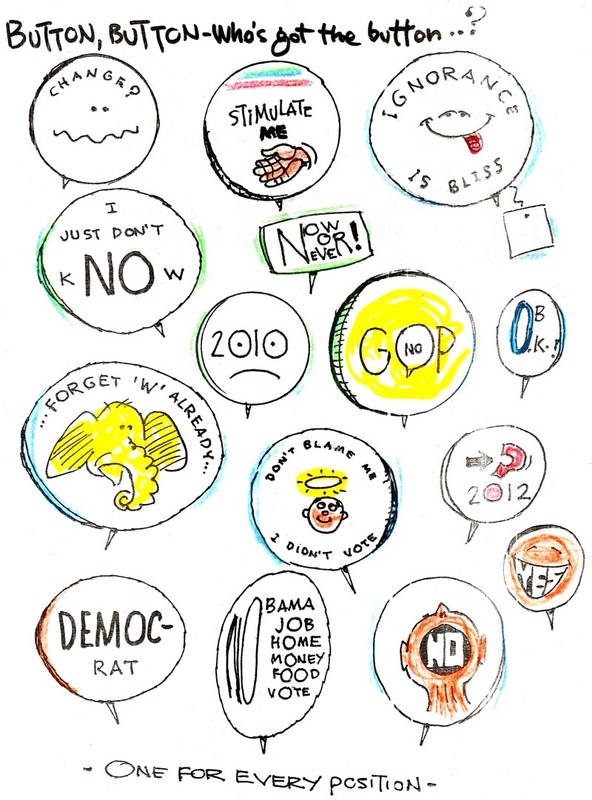 No Katzie knockoffs for this cartoonist! Greening's best-remembered strip is the delightful robot fantasy Percy -Brains He Has Nix, but he did lots of interesting series. 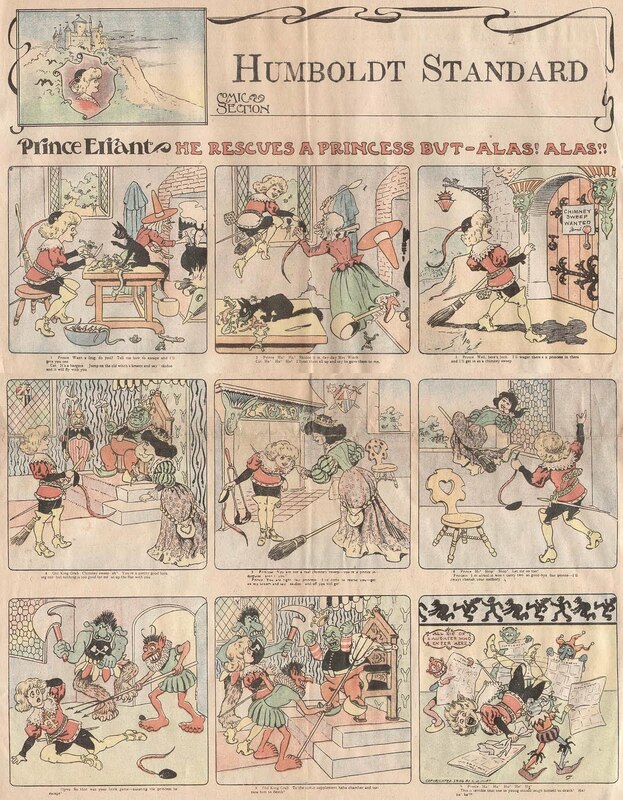 This one, Prince Errant, is about a medieval boy prince who is dead set on rescuing princesses. Things rarely turn out in his favor, though, like in the top strip here where he's consigned to a dungeon to be tortured by reading newspaper comics! I'm puzzled by how many of these early strips you post ran only for a few months. Is there some reason so many features were cancelled so quickly? Didn't they believe in giving them a year or two to build a readership? You're thinking about it the wrong way. These short-lived strips were not usually canceled as such, the cartoonists usually just went on to new ideas. In these early days the idea of being tied down to one strip, like Outcault, Dirks, etc. was not necessarily the end all and be all for newspaper cartoonists. They'd do a half-dozen, a dozen, fifty episodes of a strip and then they'd feel that the concept had been milked out and go on to something new. From Washington comes word that the federal income taxes of cartoonist Fontaine Fox's Reynard Corporation are in dispute before the United States Board of Tax Appeals. Involved are levies totalling $13,569.02. Whether the corporation is to be taxed on the amount representing the rental value of the house and studio owned by the corporation and furnished to Fox rent-free, is questioned. The second issue revolves about the deduction of $30,000 from the corporation taxes as Fox's salary. The Commissioner of Internal Revenue for the District of Columbia holds that the sum should not be deducted in its entirety. When the artist contemplated marrying off Tom Carr and the Widow Zander, after the former had been released from prison, his staff reminded him that the couple had been married previously in the story of the strip some eight years ago and then had drifted apart when the Widow Zander's husband, believed to he dead, had returned. Edson's firm conviction that no one would remember the previous situation was rocked when he was faced with the mail-bag full of reminders. Eight undergraduates of Harvard showed their admiration for Milton Caniff's artwork recently when they signed a solemn letter asking for an original drawing of Normandie, heroine of the "Terry and the Pirates" strip which Caniff creates for the Tribune-News Syndicate. The eight boys, plus a coxswain, made up the varsity crew, and when their request was answered, Normandie's picture was tacked up at the helm of the shell, where each man glanced at it as he rowed. The Yale crew subsequently bowed to the eight Harvard undergraduates and Normandie. The winning crew admitted later that it had pulled victory out of the fire last year with a picture of Burma, another of Caniff's characters. I can't believe Edson would think no one would remember the characters were already married! To me it sounds like a little CYA action because he'd actually forgot about the earlier storyline. Here's an exciting group of scans that I was alerted to by The Arthur of the Comics Project. He saw and saved them from a post by John Adcock on the Platinum Age listserv back in 2004. 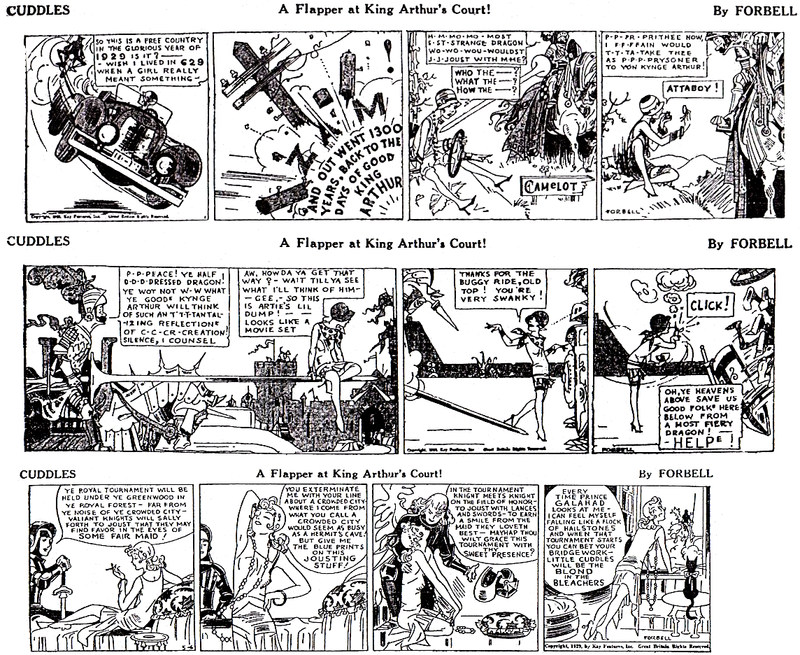 The strip, Cuddles, was drawn by the wonderful Charles Forbell in 1929 for Kay Features. In 1929 Koenigsberg was without a job but not without the desire to continue in the newspaper game. He hatched a plan to run his own chain of newspapers, and to hear him tell it, came close to succeeding. In King News, his self-serving autobiography, he claims that the chain would have included over 100 newspapers (or 50 or 35 depending on the page cited), the flagship of which was to be the Denver Post. The sharpies at the Post, though, were playing a shell game with him and though he doesn't admit it they seem to have ruined him financially. Cuddles began on March 4 1929 (at least in the San Francisco Chronicle) and the last example above, dated May 4, is the latest I've seen of the series. Yet it was advertised until 1933 along with much of the rest of Kay's rarely seen output. 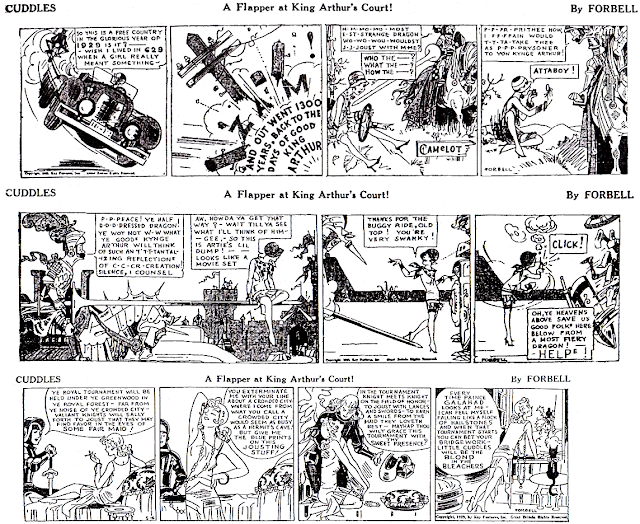 It's a shame, too, since Charles Forbell was one fine cartoonist (I just love panel 1 of the second strip above, for instance) and the subject matter, though obviously ripped off from Twain's A Connecticut Yankee in King Arthur's Court, has great possibilities. To be fair, though, flapper comics by 1929 were already looking pretty dated since the era of the flapper was on the wane. I can imagine editors seeing the new strip and snorting, "Waddya trying to sell me here? Some strip that was drawn up in 1925?" If anyone has a lead on any Kay Features strip, especially any appearing later than 1929, I'm anxious to hear from you. Haven't seen Cuddles from WNU. Do you recall the paper(s) where you saw this? Possibly they are not w.n.u., it is a fair guess though. The other strips the censor had were the old, old mcclure series Just Humans and The Clancy Kids. They also had Micky and his Gang, Drugstore Cowboys and Jungletown Fables. Maybe I'm guessing wrong that Micky is a continuation of Micky the Printer's Devil, and the three titles are really Bonnet Brown syndicate. Then the reissued Cuddles could be handled by either B-B or McClure. I'm glad to see you've been able to put the scan to good use. Thanks for the information on the series too. My brother found this one running in THE BROOKLYN CITIZEN in 1931.-----Cole Johnson. Just noticed that the original art for the third strip pictured appeared in a CBC broadcast from 1957. Check it out at 1:55. B. Cory Kilvert has the distinction of having created one of the most disturbing comic strips of all time, Dorothy and the Killies, but that not our subject for today. 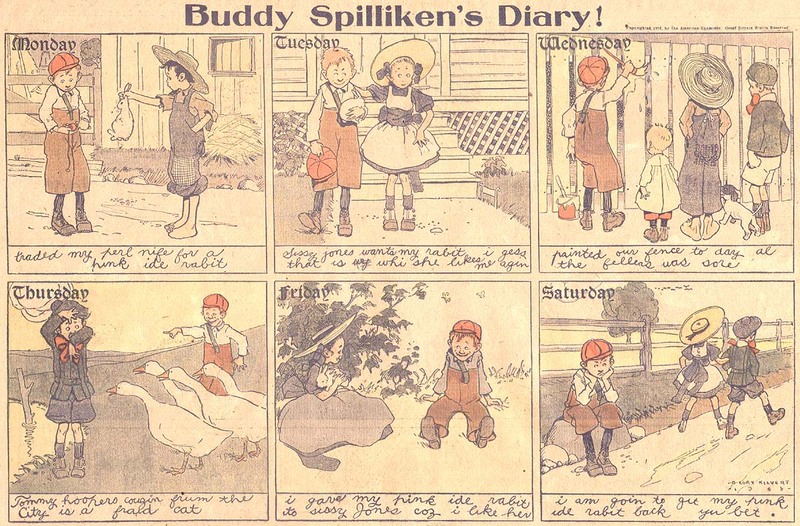 No, today we have a pretty mainstream entry from Mr. Kilvert, Buddy Spilliken's Diary. 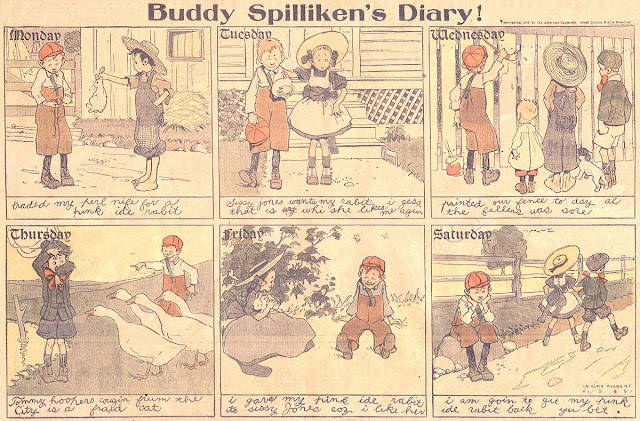 Buddy is a Tom Sawyer simulacrum, and in each strip we get a week's worth of his scrawled diary entries. It's very well executed but not the most memorable strip. 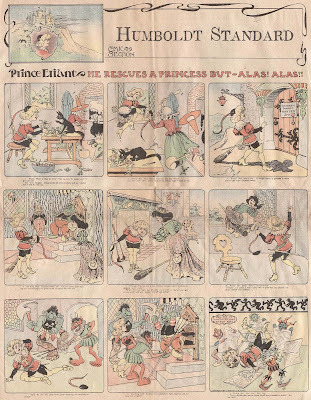 Apparently the Hearst organization thought so little of it that they didn't run it in the New York American's Sunday comics section, but only made it available to other papers as a replacement. That makes tracking it a bit of a challenge, but between the comic sections of the Los Angeles Examiner and San Francisco Examiner I think we have the complete running dates as October 11 to November 29 1908. It could have started on October 4, though -- the LA Examiner microfilm is missing that section. 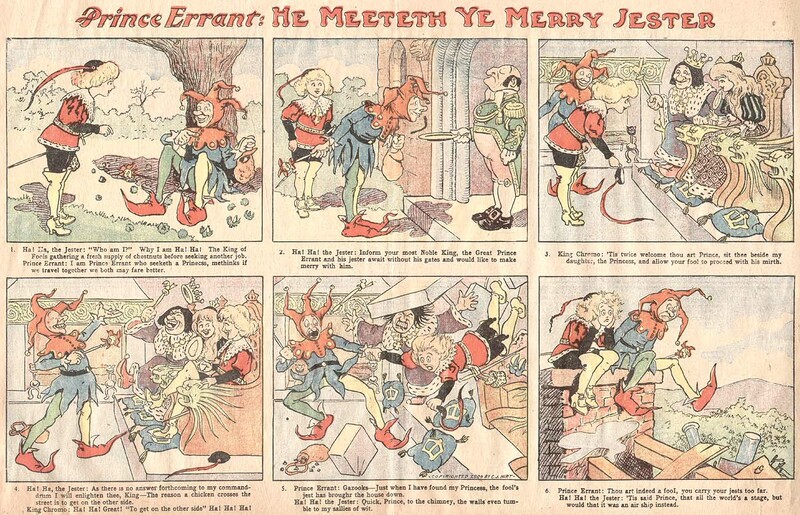 I wonder what the market would be like for some entrepreneur to take these old time newspaper comics and take the panels apart and reprint them large size into children's books? Wireless Willie is a very early radio strip, appearing less than two years after the first commercial radio broadcast in the U.S. (KDKA of Pittsburgh in November 1920). This was in the days when radio bugs built and tuned their own sets and would spend hours fiddling around to hear a faint signal from one of the very few commercial broadcasters. Radio was immensely popular, though, and many newspapers began running weekly, or even daily, radio pages. In these early days those pages were filled with wiring schematics and technical jargon, so a comic strip was just the thing to lighten up the dense and dreary page. There were many of them, and we've featured several on the blog (Bugs, Radiobituaries, Today's Hook-Up). Unlike those previously featured, Wireless Willie seems to have been a locally produced strip that ran only in the Washington Post. It ran there just four times, on April 25th and 28th and May 11th and 19th 1922. The cartoonist, C.F. Cagney, despite his crude but pleasant style and obvious comfort with the form, is otherwise unknown to me. Thanks to Cole Johnson who supplied not only the scan for today's post but also all the data about this feature. Cagney was born in Jersey City, New Jersey around September 1892 according to the 1900 US Federal Census. In the 1910 Census Cagney was working in the printing industry where he was making signs. In the April 4, 1913 edition of the Jersey Journal, there was an article about a minstrel show by the Alpine Lodge; there was a credit for "C.F. Cagney, artist of cut on showcards." By 1920 he was an artist working for an advertising company; he was still living in Jersey City. Ten years later Cagney was still working as a commercial artist. Correction: The title of Chauncey Cagney's book is "The Bull Moose Mother Goose"
A Jersey City boy, Chauncey F. Cagney, son of former Assemblyman David H. Cagney of 150 Bowers Street, has the distinction of having won in an open contest the contract for drawing the illustrations and cartoons in the "Bull Moose Mother Goose Book," a pamphlet of sixty-four pages of witty rhymes sold throughout the country for the benefit of the Roosevelt campaign fund. Young Mr. Cagney, who is only 26 years old, is a student in a New York art school. He is studying to become an illustrator and cartoonist. His work has already attracted the attention of critics and the scores of clever illustrations in the "Bull Moose Mother Goose Book" mark him as a young man of undoubted talent. The jingles and rhymes in the book were written by Miss Sallie Macrum Cabbage, a member of the smart set of Pittsburg, and a relative of the Thaw family. Thanks for the bio, Alex! Sounds like Cagney wasn't based in Washington after all, so Wireless Willie might well have been a syndicated item. Unfortunately we have no additional clues as yet to say which syndicate he worked for. Searching through Ancestry.com I did not find any military draft information, an obituary or a Social Security Death Index report for Chauncey F. Cagney. However, there was a Charles Frances Cagney who was born on October 5, 1922 in Jersey City, New Jersey. (The birth date is very close to the 1900 Census birth date of September 1922 for Chauncey.) This information is from a World War I draft registration card dated June 1, 1917. Charles was living in Duluth, Minnesota at the time. Charles died in May 1970 in Washington, D.C. He had applied for his Social Security number in Virginia. I believe Chauncey and Charles were the same person. Looking at the 1930 Census, Chauncey and his younger sister, Margaret, were living together in Jersey City; she was born on November 10, 1893. Margaret passed away in November 1968 in Washington, D.C.